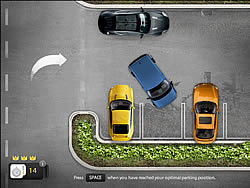 Park your car as accurately as possible int the marked space. Do not hit cars or ohter obstacles, otherwise you car will suffer damage. Up Arrow Key - Move. Left / Right Arrow Keys - Steer. Spacebar - When your car is in the correct position.